GALLIPOLIS — Gallipolis Leos Club recently welcomed new members and new officers. 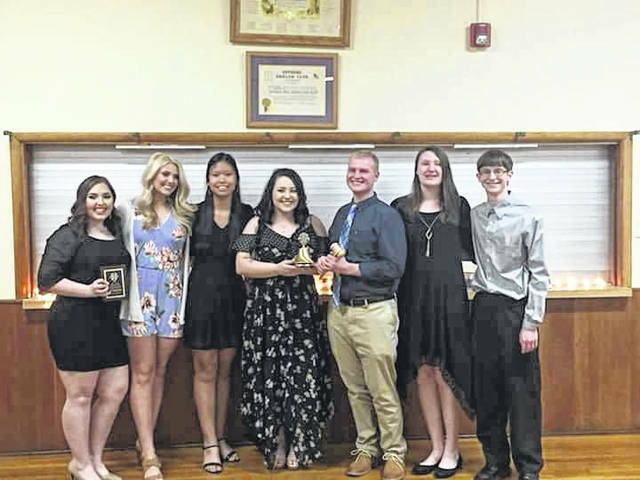 With the school year winding down, the Leos Club at Gallia Academy High School celebrated its inaugural year of community service. Currently the group is 40 strong with several new members joining the ranks, who will formally join the club May 19. A major component of the evening was celebrating what Leos have done in the past year. Their work ranged from packing lunches with the Gallia County Health Department to purchasing 230 pairs of new socks for veterans in the the VA hospital in Chillicothe. “Snack pack was one of the big ones, for me it was one of the most important ones. We worked with Jill Cox at the Gallia Health Department and with Guiding Hand. Throughout the year I believe we packed 1220 lunches,” said Mayes. The organization also worked to collect donations to give stuffed animals to the Gallia Sheriff’s Office and Pleasant Valley Hospital for children going through a crisis situation. “We gathered money and donations to buy stuffed animals for the sheriffs department and Pleasant Valley Hospital to have, and that’s a big deal because those children need something in a time of struggle and maybe don’t know where their parents are,” said Mayes. The Leos also gathered and donated candy and stockings for children around Christmas time. However, they are looking ahead to the future. Derek Henry was appointed as the next president of the club and is ready for a year full of community service. The group has also planned to host multiple dinners between July and December specifically for those who have diabetes. According to Mayes, the dinners will have a chef on hand to discuss good food preparation and how to have a healthier lifestyle in managing diabetes. “Derek Henry has some ideas he is helping us with, he is quite the motivated future president and I very much look forward to working with him,” said Mayes.